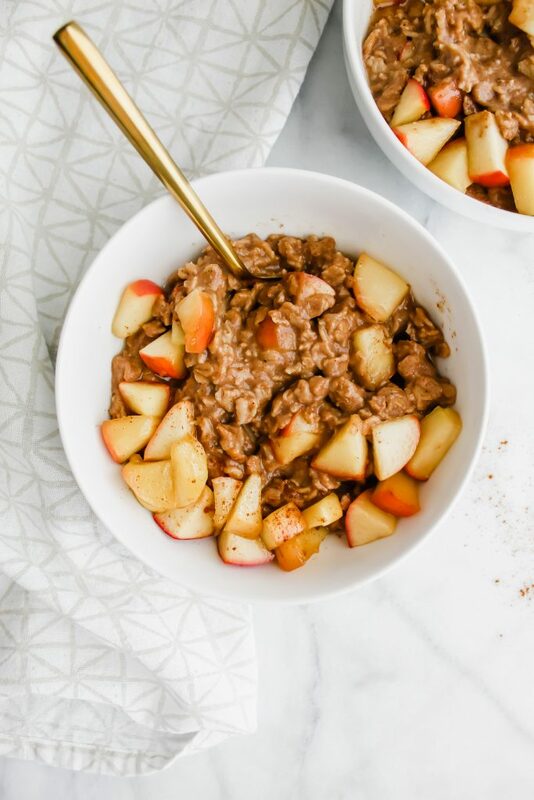 This Chai Spiced Apple Oatmeal is the perfect cozy breakfast! 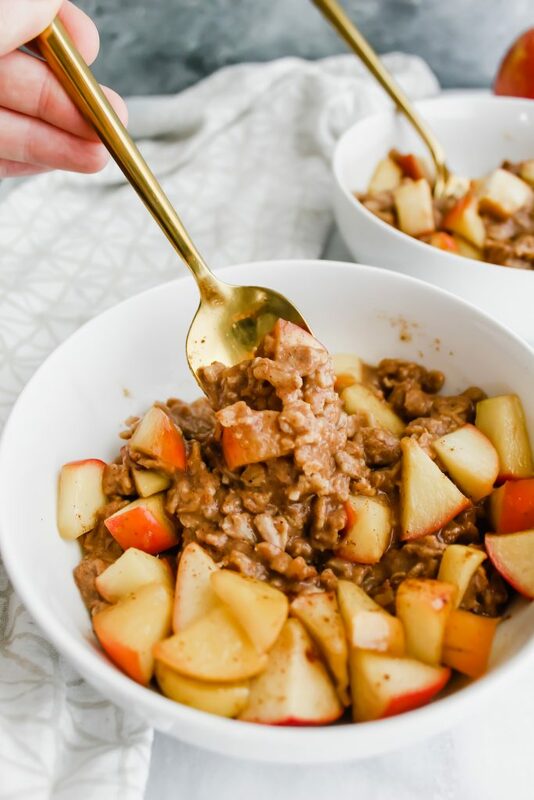 A nourishing bowl of creamy chai spiced oats topped with warm brown sugar apples! It’s the best Fall breakfast. To me, there is no better way to start off a morning than with a steaming cup of coffee with extra cream and a large nourishing bowl of oatmeal. Normally, you know that I love overnight oats. For example, my Peaches and Cream Overnight Oats got my through the Summer. Last Winter, my Banana Bread Overnight Oats were part of my morning routine. This Fall, it’s warm, it’s cozy. It’s not rushed. It’s a slow, easy morning. Scrolling through Instagram between bites. Or, if I’m being really good that morning – my phone is still put away and I’m just focusing on being present in the morning or doing my devotional. 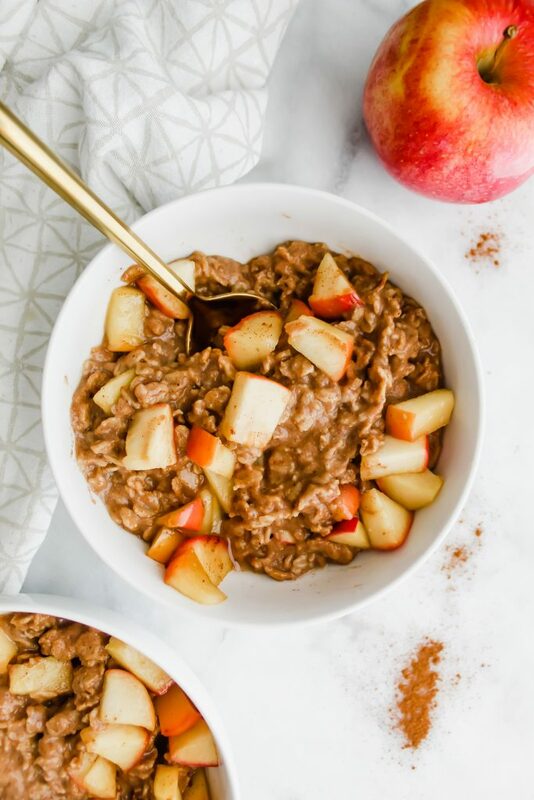 It’s Chai Spiced Apple Oatmeal aka the perfect way to begin a morning. 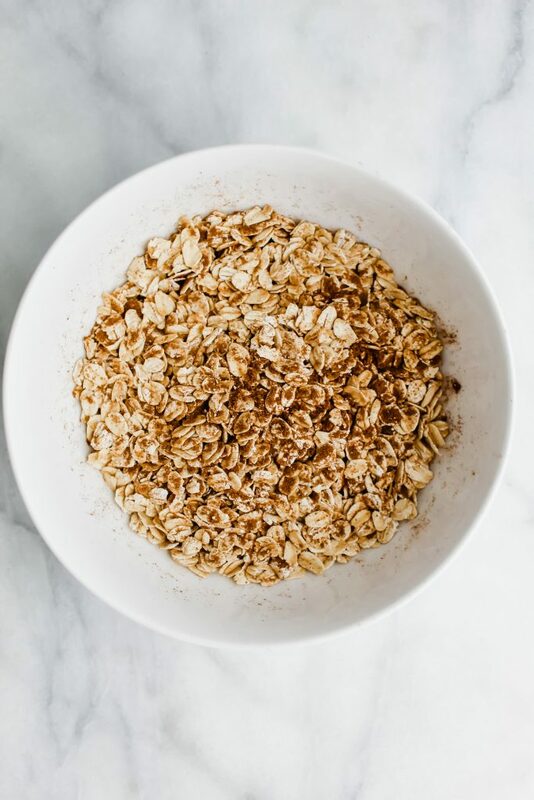 These Chai Spiced Apple Oats are coated in the most delicious homemade chai spice blend ever! It’s slightly spicy – but not like a “burn your mouth hot sauce” type of spicy. It’s more like a “warm you down to your toes with Fall spices” type of spicy. Make sense? My favorite part of the oatmeal are the apples. Oh my gosh. They’re soft, sweet and melt in your mouth delicious. The creamy thick spicy chai oats matched with sweet tender brown sugary delicious soft apples make for the perfect balance of sweet/spicy. The apples actually remind me of the fried apples from Cracker Barrel. Please tell me you’ve been to Cracker Barrel, friends. If not, it’s a Southern based chain restaurant you can find off of any interstate exit that has things like chicken fried steak with gravy and vegetable plate options that include mac and cheese and french fries. Also, they bring you both biscuits AND cornbread. It’s pretty wonderful. But the best food item there, hands down is the fried apples. They’re sweet, covered in a gooey sugary apple-y sauce and I could eat an entire jar of them. Especially if you add the apples on top of a warm biscuit. Yes please! Speaking of biscuits, how good do these Butternut Squash Biscuits look that my friend Jo made?! And that maple cinnamon butter?! Dying. Okay, back to the Chai Spiced Apple Oatmeal. Here is what you’ll need for the Chai Spice! So I mixed all of the spices listed above together in a small bowl. From there, I added in my oats and made sure that the oats were fully combined with the spices. I set those aside. Next, I began boiling my milk. I used unsweetened vanilla almond milk but feel free to use whichever milk you’d like – just make sure it doesn’t scorch! I also added some vanilla extract for extra goodness. Bring that to a boil and then add in your oats. Turn down to medium/low heat and let it cook for 5 minutes or so. Basically you want to cook it until the oats are thick and creamy and delicious. While the oats are boiling, you’re going to want to dice up an apple. Throw it in a saute pan with melted butter and some brown sugar on medium heat. 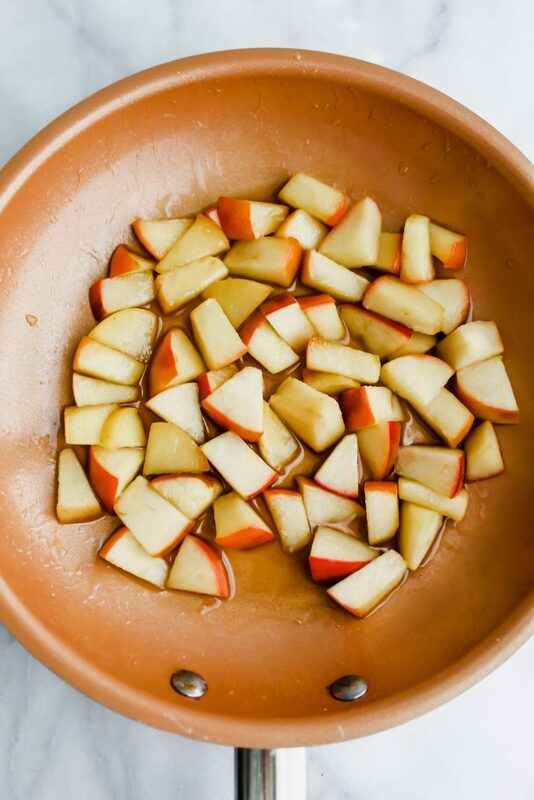 Let it caramelize and cook and the apples will turn soft and EXTRA delicious! By now, your oats should be done. Take them off the heat and I like to let them sit for a minute or so just to cool down. Next, I added the cooked chai spiced oats into a bowl. I added the delicious soft apples on top. I added a sprinkle of more cinnamon. And there you go! You’re all set. Any questions? Can I add extra sugar? Of course! I felt as if the apples made this oatmeal sweet enough – but I think an extra pinch of brown sugar in the oats themselves would be delicious! Can I make these into overnight oats? Absolutely! Just add the oats into a mason jar, add your spices and thoroughly mix together. Add the chopped apples on top along with a pinch of brown sugar and then your almond milk. Let sit overnight. This option is equally as delicious – just better for on the go and not a warm and cozy at home breakfast. Can I make these in a microwave? Uhhhh heck yeah! Just mix the milk and oats prior to putting a microwave safe bowl into the microwave. I usually let it go for about 1 minute, take it out, stir it and check the consistency and put it back in if I want it thicker. What I’ve always found out about oatmeal is the longer you let it cook, the thicker it gets and vice versa. What if I don’t have all of the spices needed for the chai spice blend? If needed, you can use just cinnamon and nutmeg – which are both pretty common pantry spices compared to something like clove/all-spice. However, I encourage you to go check your local grocery store! For example, Aldi sells their Fall seasonal spices for super cheap. In fact, I got my cloves and all-spice there for .99 cents each! I hope you guys love this cozy Fall breakfast. It’s my new go-to. As always, remember to tag me on Instagram @ourbalancedbowl if you make it! I love to see your creations! 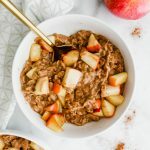 This Chai Spiced Apple Oatmeal is the perfect cozy breakfast! 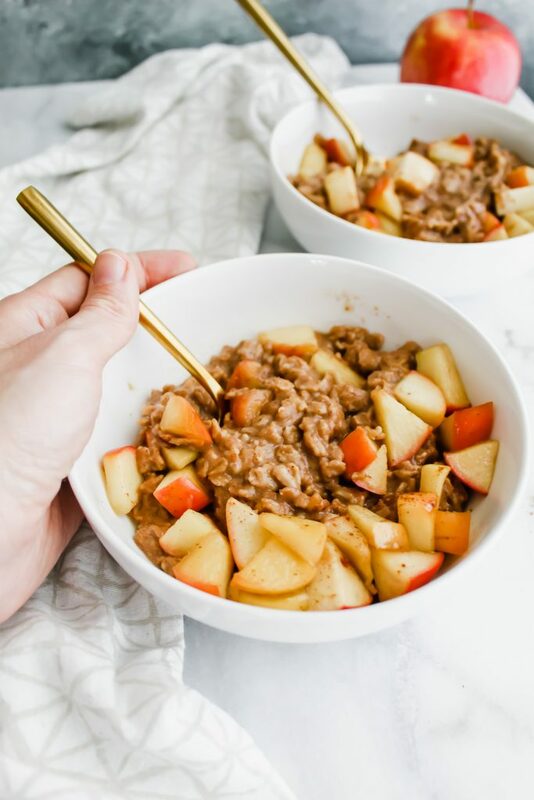 A nourishing bowl of creamy chai spiced oats topped with warm brown sugar apples! It's the best Fall breakfast. Combine your chai spices into a small bowl. Add in your rolled oats, thoroughly combine with the spices and set aside. Dice up your apple into small pieces. Set aside. In a medium sized pot, bring the almond milk and vanilla extract to a boil. Add in your oats and turn the heat down to medium/low. Let it cook for about 5 minutes or until thick and creamy. While that's cooking, add your butter to a saute pan. Add in your diced apples and the brown sugar. Combine and let cook on medium heat until soft and delicious. Once the oatmeal is done, stir in the 1/2 cup of the applesauce in the pot. Next, add the chai spiced oats to a small bowl. Top with the apples and an extra dash of cinnamon and/or brown sugar if you'd like. Eat while warm! 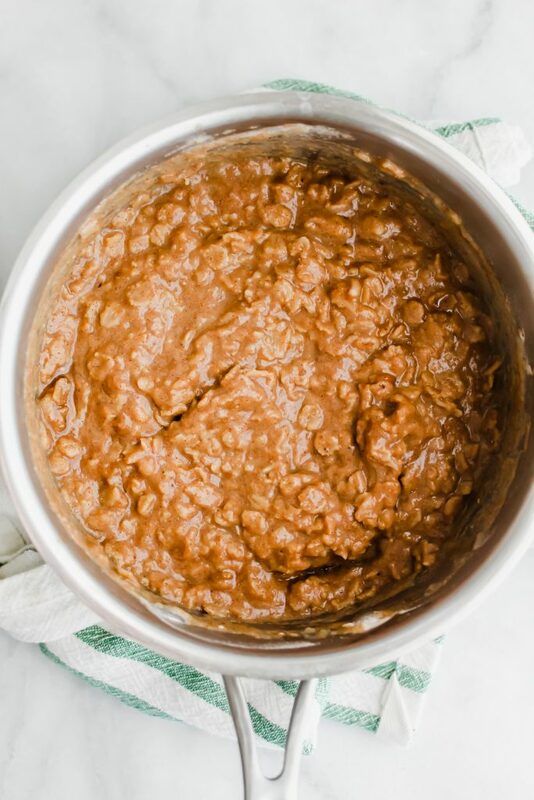 Feel free to add more brown sugar if you'd prefer this oatmeal sweeter! Uh hello I’m making these as soon as possible. They look so incredibly creamy! I can’t wait to try this on a cold morning. It will warm you to your toes! Sounds so yummy! Especially during these cold days. I was kinda thrown, I assumed their was chai seed in the oatmeal. I didn’t realize chai was a spice mix…I think I will try adding chai seeds, as well. I think I’ll have it for breakfast. Thanks!